The rich fool thought when he was wise when he stored up all his goods for himself. He soon found out that God does not like us to be greedy. Have fun reading the story and see if you can find hidden corn sheaf on each page. This is a retelling of Luke 12:13-21. 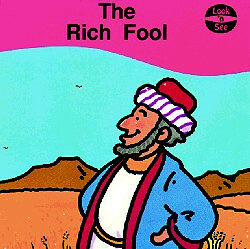 The Rich Fool by Ros Woodman was published by Christian Focus Publications in April 1996 and is our 3125th best seller. The ISBN for The Rich Fool is 9781857921724. Be the first to review The Rich Fool! Got a question? No problem! Just click here to ask us about The Rich Fool.